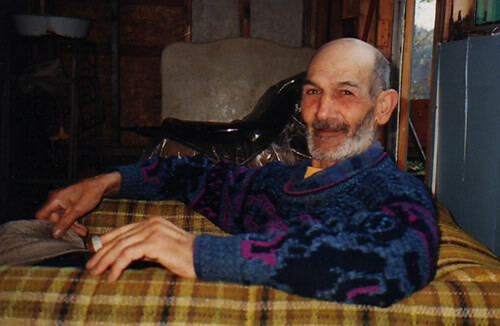 Eddie Mandaggio was born in Manitoba in 1927. He spent his early years working in Northern Manitoba and Ontario as a trapper, and as a hunting and fishing guide. He came to Nova Scotia in 1951 and settled in Camperdown, Queen’s Country, where he lived until his death in 2003. He initially worked for the railroad for eight years, and then worked in the logging camps. Eddie started carving in 1974 out of a desire to make decorations for his cabin. He followed with painting in 1976. His subjects are geese, roosters, cows, horses and also some human heads. His carved pieces greatly outnumber his painted works. In the mid -nineties I had the occasion to meet Mr. Mandaggio, and although I was trying to take in as many artists as I could in a short stay, and had intended to just stay for an hour, we became so engaged in conversation that I ended up spending the entire afternoon. I missed out on meeting a few others but my time with Eddie remains close to my heart. I flew to Nova Scotia to view and consider purchasing a major folk art collection which belonged to a friend of a friend named Iris Newman. Iris is a lovely person. 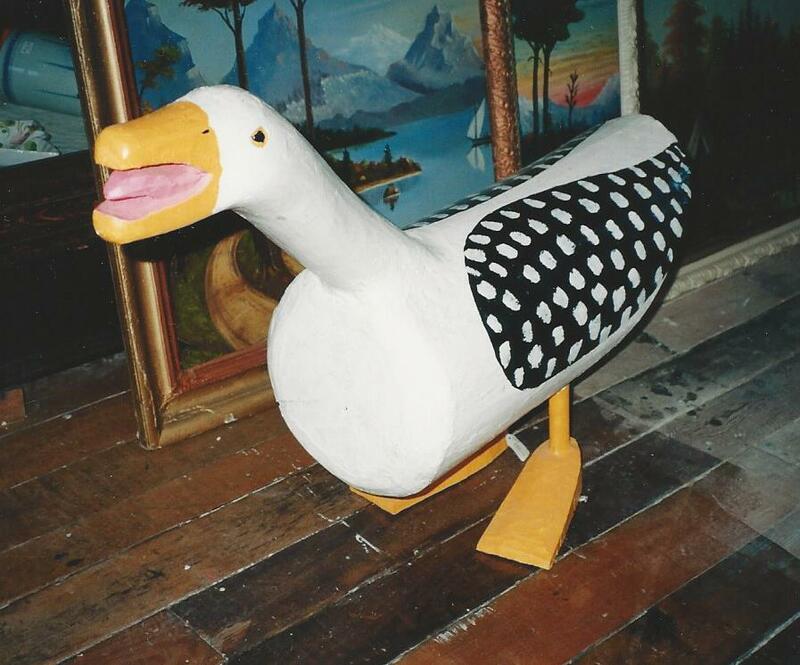 who got bit early by the folk art bug,and had the means, space, and desire to build a major collection, purchasing major works directly from the artists. She is featured in the NFB film “folk art found me”, and she is generally acknowledged as one of the main promotors and supporters of the Nova Scotia folk art community. We had a lovely lunch and fell into talking like old friends for a couple of hours before she took me around her large home and showed me the extent of the collection. Although amazing in quality and scope It turned out to be too many massive pieces which I knew would be hard to place, and she was strictly committed to an “all or nothing” deal so it didn’t work out, but I learned a lot from her and we did remain friends. Of this vast collection, one of the most impressive things for me was two very large paintings of tiny cows in a big field by Eddie Mandaggio. 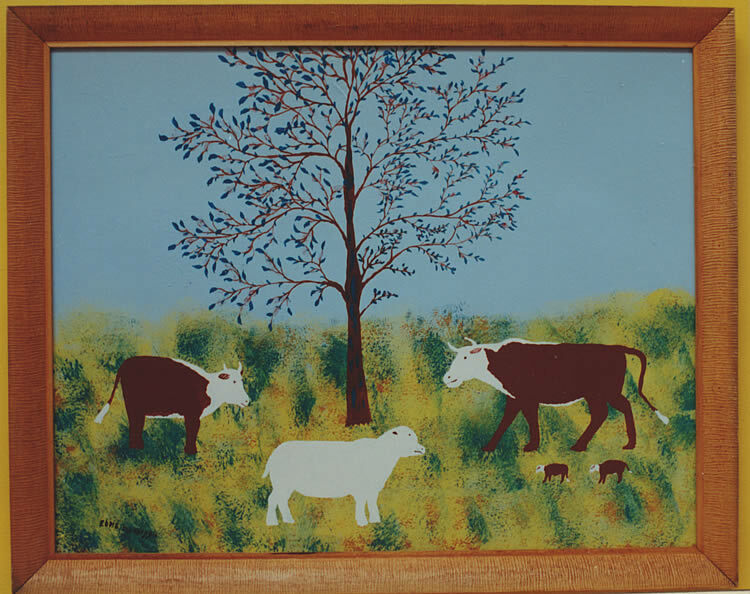 It was the first Mandaggio paintings I had seen and there is something about those giant fields with those tiny cows that hit all my buttons. She was keeping them and I completely understand why. So after an afternoon of talking, and documenting the collection it was time for me to go. As I was leaving I told Iris that the following day before I had to catch the evening flight home, I was going to go to the Lunenburg area to meet the Naugler brothers, Garnet Macphail, and Eddie Mandaggio who was already one of my favourite Nova Scotia folk artists. “Oh that’s great Phil. You’ll have a wonderful time, but I must ask one thing of you.” O.K.? “When you get to Eddie’s you will see that he has recently carved a very large moose head trophy, and I have decided to buy it, so don’t you go and buy it.” Ouch. I hated to agree but Iris is a lovely and determined person, and I was still considering her collection so I reluctantly agreed. Of course there in the background the entire time we are talking hung the extraordinarily beautiful massive moose head on a red heart shaped crest which Iris had forbidden me to buy. Tagged $750. I would have given him the cash in a second if I was not bound to my word. What can you do? That was the one and only time I met Eddie, and he became quite ill and stopped carving soon after. I never did get on to see Garnet MacPhail, but I don’t regret a minute of the time I spent there with Eddie in Camperdown. 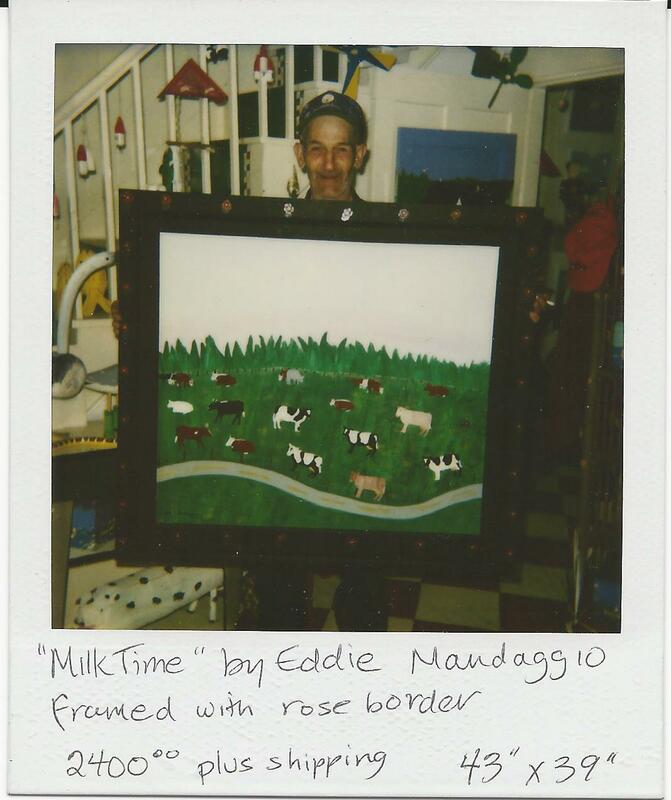 A few months later I received the following polaroid of Eddie with a new cows in the field painting. Unfortunately I didn’t move quickly enough and missed it. If you would like to know more about Eddie, the Black Sheep Gallery has posted a wonderful series of You tube videos you can look up.